The following provides a summary of the achievements of the Convention to date under each action as outlined by both Action Plans. Click here for the latest universalization status map and list of States Parties. 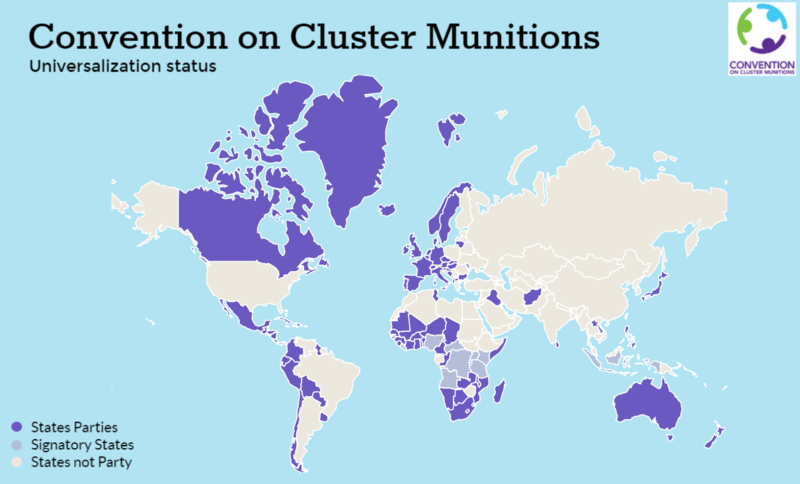 Every State Party has 8 years to destroy all cluster munitions after the Convention enters into force for that State. Click here for an overview of stockpile destruction completion and deadlines. Every State Party has 10 years to clear and destroy all cluster munition remnants after the Convention enters into force for that State. Click here for an overview of clearance of contaminated areas completion and deadlines. To date, 11 States Parties have reported to have cluster munition victims. As required by the Dubrovnik Action Plan, the majority of States Parties with victim assistance obligations have reported on the designation of a national focal point, provided information on a national action plan on victim assistance, and reported having involved victims in decision-making process. In recent years, Coordinators have increased efforts to work across Conventional Weapons Treaties (CCM, APMBC and CCW) in promoting an integrated approach to victim assistance. Convention on Cluster Munitions Coordinators for 2016 and 2017 on Victim Assistance (Australia, Chile and Italy) developed the Guidance on an Integrated Approach to Victim Assistance which was published in late 2016. There has been an increasing trend in the number of States Parties with obligations under Articles 3, 4, 5 and/or 9 sharing challenges and requesting for assistance through their Article 7 reports. Likewise, there is a positive increase of States Parties reporting to have provided assistance, with a majority of them having reported a rise in their global funding for mine action activities in their most recent Article 7 report. More workshops and meetings have been hosted by Coordinators on International Cooperation and Assistance in 2017 and 2018 to facilitate communication and foster partnerships between donor and States that have requested assistance. In 2017, the German Presidency of the 7MSP introduced the country coalitions concept to the Convention as a means to enhance international cooperation, which has already led to the formation of few partnerships. To date, 3 country coalitions have been established, with one of these country coalitions resulting in the State Party completing its stockpile destruction more than a year ahead of its deadline. Initial reports clarify which obligations are relevant for which States Parties, and are essential for establishing the benchmark against which progress is measured. To date 89 States Parties have submitted their initial report, leaving 13 States Parties that have missed their deadline to submit their initial report. Annual reports demonstrate individual States Parties’ ongoing efforts in implementing the Convention. Timely and quality reports are also key in allowing States to share their challenges and request assistance to fulfill their obligations. Reporting rates have been notably steady since States Parties began reporting, averaging 75% compliance each year. However, increasing the reporting rate and quality remains a priority under the Convention. Click here for the UNODA database of Article 7 reports. The number of States Parties that have reported through their Article 7 reports to have enacted specific implementation law or that their existing law is deemed sufficient has been steadily increasing over the years. In 2011, only 11 States Parties had specific implementation law, and this has increased to 29 in the present day. 8 States Parties had reported to have sufficient existing law in 2011, and this has arisen to 26. In addition to that 18 States Parties currently have legislation under consideration or in the process of being adopted. Nevertheless, 26 States Parties still need to report or clarify if they have introduced national legislation that is specific to the Convention.